To make landscapes more responsive to the needs of business and society 3Keel, a sustainability advisor, has developed an approach called the Landscape Enterprise Networks (LENs). LENs is a regionally focused approach which harnesses commercial interest in how landscapes function to drive investment and innovation around strategic assets like soils, aquifers, access infrastructure, habitats and tree cover. 3Keel’s work on the LENs concept was developed in response to two needs. Firstly, private sector clients who wish to influence the landscapes that impact their supply chains, or their property and infrastructure investments. And secondly policy and NGO clients who are interested in harnessing commercial interest in landscapes to drive outcomes that can go beyond grants and philanthropy. In January 2018 the UK Government published their long term environmental ambitions to set the tone for future policies and priority areas of focus in A Green Future: Our 25 Year Plan to Improve our Environment. 3Keel’s work deploying their Landscape Enterprise Network (LENs) framework programme, working in partnership with Nestlé and Business in the Community (BITC), featured as an example of best practice within the plan (page 140). The plan says it will consider the results of a pilot 3Keel are running with Natural England in the Hampshire Avon catchment and assess how to encourage better uptake of this approach to engaging the private sector. Current work includes a major new collaboration with the N8 Group of Universities, BITC and Nestlé, funded through the Global Food Security programme, to develop the approach in Cumbria and Dumfries and Galloway. This follows on from projects delivered over the past year in East Anglia (download pdf) and Cumbria (download pdf) identifying the business case for a broad range of sectors to invest in regional natural capital. When it comes to the LENs process, the first step is to identify a small group of businesses with overlapping interests in a landscape (see graphic below). By understanding in detail the landscape functions that each of those businesses have a commercial interest in, as well as the landscape assets that underpin those functions, they can start to see how and where their interests overlap. Once 3Keel know what and where the shared assets are, they can work on identifying the sorts of shared actions - investments, market opportunities, or agreements - that could secure and enhance those assets. 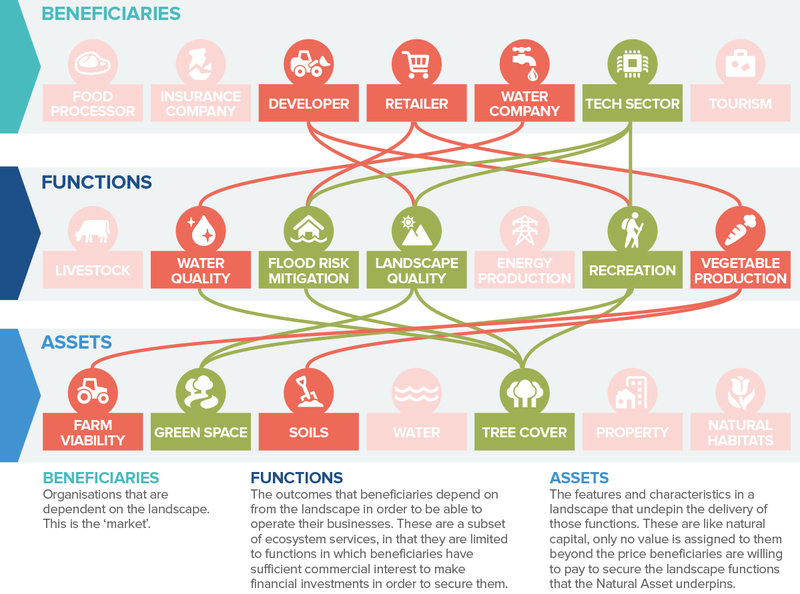 The LENS approach is deliberately ‘market-led’ - aiming to build and harness private sector demand for long term landscape quality and functionality. The approach is distinct from more theoretical economic approaches to natural capital and draws heavily on 3Keel’s experience in understanding the business fundamentals that drive and inform the sort of decisions that might make a difference.